Purchase Center in the Elbe metropolis. ZPMC is the world’s largest manufacturer of steel structures and container bridges, with the latter holding a global market share of 75%. Out of the company’s annual sales of US$ 1bn, 60% is generated in Europe. Its products are being used in all major German ports, including Hamburg. In addition, the group has been expanding its business activities to offshore facilities, specialized shipbuilding, and related services. In the year 2014, the HWF Hamburg Business Development Corporation successfully brought a first sales office of ZMPC to Hamburg. There, 12 employees are currently working, i.e. ten Hamburg locals and two Chinese staff. ZMPC’s expansion will be accompanied by the Hamburg Liaison Office in Shanghai and HWF. Hamburg’s First Mayor Olaf Scholz will be among the guests speakers at the official inauguration of the European Purchase Center of the Shanghai Zhenhua Port Machinery (ZPMC). Lu Jianzhong, President of ZPMC, says: ”Hamburg is not only one of Europe's most important ports and the starting point for the offshore wind energy activities in North Sea and Baltic Sea. The Port of Hamburg is also a very important customer of our company. We generate 60% of our sales in Europe. The expansion of our activities in Europe was thus an obvious step. We chose Hamburg because the majority of our partners are active here." East, Australia, the US, Mexico, South America, North Africa, the Middle East, the Red Sea region, and the Indian subcontinent. With HHLA, ZPMC has been maintaining business relations since 1999, which are to be further expanded and strengthened in future. 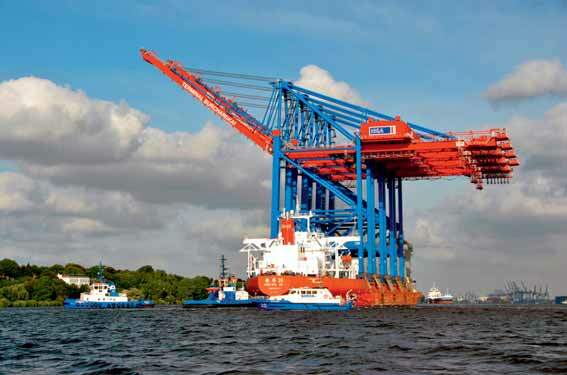 A contract for the delivery of three more gantry cranes will be signed next week in Hamburg. The Hamburg section of Siemens and ZPMC are also co-operating. Both ZPMC and its parent company, the China Communications Construction Company (CCCC), are closely linked to Hamburg. Chen Fenjian, CEO of CCCC, and Lu Jianzhong, president of ZPMC, for example, were speakers at the ‘Hamburg Summit’ hosted by the Hamburg Chamber of Commerce. The company is a global market leader in the production of container bridges, with their heavy-duty cranes being used by 120 ports in the world. Eighty-four per cent of sales are generated abroad, 60% in Europe alone. The company’s growth rate in the years 2004 to 2006 was 310%. Today, the company is a subsidiary of the China Communications Construction Company (CCCC).